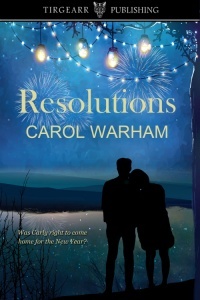 I’m currently organising a blog tour for Carol Warham’s contemporary romance novel, Resolutions. A few days before the New Year, Carly Mitchell returns home to the small town on the Yorkshire moors. Her intention for the short visit is to make her apologies and offer an explanation for her action. A year earlier, she fled, leaving her bridegroom and friends bewildered. She’s met with mixed reactions, ranging from curiosity to open hostility. However, when an emergency arises, Carly agrees to change her plans and stay a little longer. Falling in love with the new local doctor, Ben Thornton, was not part of her original plan either. Especially when it appears his past is shrouded in mystery. Complications and tensions increase during the town’s New Year celebrations and she begins to doubt whether she has done the right thing by coming home. Can she find the resolution she needs to overcome the challenges facing her, or will she run away again? Resolutions is published by Tirgearr Publishing and is available from Amazon UK, Amazon US, Barnes & Noble, iBooks, Kobo and Smashwords. The tour runs from 18th – 22nd December (weekdays only). I’m looking for five blogs which will host guest blogs or interviews. Review copies are also available.